Australian product developer and manufacturer, FOMOFx, move to protect their intellectual property by engaging intellectual property law specialists Franke Hyland. Musician Peter Walker played, toured and did sessions for years before moving to the other side of the control room window as a recording engineer & producer. That allowed him to develop close working relationships with many great players, often spawning good friendships. Always a “tone hound”, he developed and built stomp boxes and pedal-board rigs for himself and others. Along the way he has been lucky enough to have premier players willing to be crash-test-dummies on gigs and in the studio. One musical accessory that is often used by guitarists is the “whammy bar”, a lever placed below the strings that allows the artist to change the tension of the strings, altering the pitch resulting in a vibrato effect. Some of the greatest guitarists such as Jeff Beck or Jimi Hendrix have achieved their trademark sounds by using a whammy. There are many different types of whammy bar – all relying on a mechanical system to alter the string tension – but this is not always satisfactory because ultimately this degrades the tuning of the instrument and can cause strings to break more readily. After much reflection, Peter’s company FOMOFx developed the Virtual Jeff, a whammy design that not only did away with the re-tensioning, it also allowed greater control over the pitch change and resulting effect. 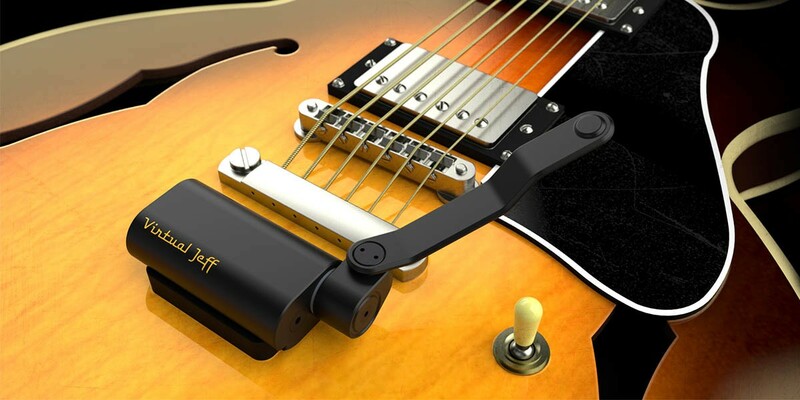 Moreover it could also be attached to acoustic guitars (often difficult to achieve with a mechanical design) and bass guitars. Seeing that his invention would be in great demand, Peter sought out the help of intellectual property law specialists Franke Hyland to help him protect his idea. They initiated an IP strategy to identify and develop patents to cover the Virtual Jeff. The protection process involved working with FOMOFx to analyse other existing whammy systems available and those already covered by patents. Franke Hyland were then able to identify various aspects of the design where patents could be developed, and filed applications for them in Australia. International protection is also being sought. Recently the Virtual Jeff won a coveted “Best in Show” award at the 2015 National Association of Music Merchants annual convention in the US. “FOMOFx can now rely on a solid IP base from which to commercialise their product,” says Peter Franke, a partner at Franke Hyland.